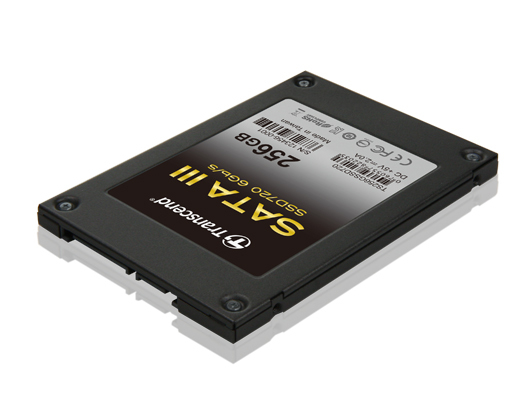 Transcend Information has announced the launch of its new, next generation SSD720 SATA III 6GB/s SSD. The SSD720 delivers significantly improved performance over standard rotating hard drives and its focus on productivity-enhancement is the ideal solution for demanding system applications, such as specialized multimedia computing and serious gaming. Combined with a powerful SandForce-Driven controller and the latest SATA III 6Gb/s specification, the SSD720 offers speedy transfer rates of up to 550MB/s read and 500MB/s write, taking only 15 seconds to transfer a 5GB DVD. This enables faster system boot up, application launch speed, data transfers, and overall system responsiveness. Additionally, support for Native Command Queuing (NCQ) increases the performance and efficiency of the SSD720 by optimizing the order that received read and write commands are executed. The SSD720’s design features a durable yet lightweight metal outer case and has a slim thickness of just 7mm, catering to the size limitations of today's modern Ultrabooks, notebooks, and other thin and light form factor devices. Despite its size, the 7mm SSD720 uses the same SATA connector used on a 2.5'' HDD and is backwards compatible with SATA II/I (3Gbps/1.5Gbps) interface. The SSD is also built with reliable NAND flash memory with no moving parts and provides resistance from shock and vibration, all the while offering low power consumption and cool, silent operation to resulting in increased efficiency and longer battery runtime. For Windows 7 users, the SSD720 fully supports the TRIM command, which automatically, and permanently, removes deleted data, helping to maintain optimum write speeds and prevent long-term SSD wear. For other operating systems that do not support the TRIM command, the SSD720 uses an intelligent garbage collection algorithm to manage advanced free space. Built-in wear-levelling and Error Correction Code (ECC) help ensure reliable data transfer to further increase the lifespan of the SSD720. In addition, it fully supports the S.M.A.R.T. command, which helps detect possible hard drive failures before they occur.